My first attempt at the Tribute to Katharine Hepburn Brownies from this week's TWD has been bothering me. So today I made them again and while I have never really been a brownie fan, NOW I get it. These were fan-freakin-tastic! This time around I had a brownie which was densely fudgy with a rich, complex flavour. I would actually go so far as to say these are the best brownies i've ever had. Woo hoo! Yay! I'm glad you loved them this time! 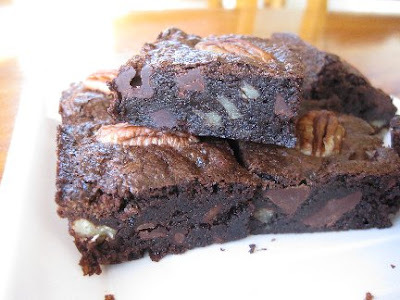 They're my new favorite brownies!